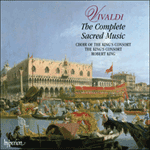 Vivaldi’s Kyrie in G minor for double choir and orchestra dates from the 1720s and was probably the companion to a lost setting of the Gloria in B flat major, for which an introductory motet survives. Its first ‘Kyrie eleison’ movement opens with the solemn chordal passage mentioned above. This is answered by a different idea, based on a broken-chord figure on strings. The two musical elements alternate before being combined at the end of the movement. The ‘Christe eleison’ is a gentle ‘duet’ for the two cori, each consisting of sopranos and altos with strings. Here the florid writing in semiquavers for the singers is echoed attractively by the instrumental bass. 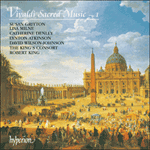 For the second ‘Kyrie eleison’ Vivaldi writes a short choral introduction followed by a severe double fugue for united cori. It is suspected by some scholars that this movement is adapted from another work, possibly by an older composer. Be this as it may, the fugue is powerfully eloquent and sustains successfully the impassioned, chromatic character of the composition.